You may have felt that you have given all you have to give. Perhaps someone has taken advantage of your nurturing ways? 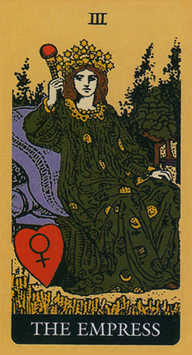 The Empress is reminding you that you are incredibly powerful. You don’t need to close down your energy or become angry and defensive. When you stand in your power and remember who you are, when you love yourself and spend time recharging your creative juices, everything changes. Make sure that you set strong boundaries but also keep that loving, warm and abundant heart open. A creative idea is in your hands, time to give birth to your dreams.